And so it begins! 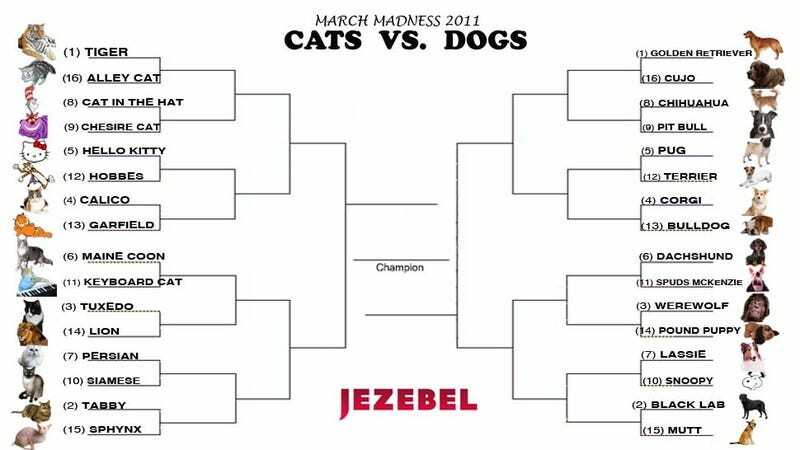 It's the very first day of Jezebel's ultimate Cats vs. Dogs tournament, wherein felines and canines will face off for the title of General Bestness, as determined by your votes. Put on your water wings and get ready to dive in. Kicking off competition in the Cat Conference is the top-seeded tiger (panthera tigris) — the largest of those captivating big cats that rule the savannahs and jungles of NatGeo and Discovery. Its majesty — and the cuteness of its cubs — is unquestionable. That is, unless the common Alley Cat (seeded at 16) can take down this goliath. Don't underestimate the feral feline; in its hunger lies its greatest strength — a powerful and sometimes never-ending yowl. Gameplay in the Dog Conference will begin with no. 1 seed Golden Retriever, the apple pie of canines. The Golden is easy-going and intelligent; their nature makes for good guide dogs, police dogs, and lovable family dogs. On the absolute opposite spectrum is Cujo, a rabid and bloodthirsty Saint Bernard, and the frightening (and fictitious) creation of horror-master Stephen King. Shudder. Polls remain open until 3pm tomorrow; shortly thereafter we'll declare a winner and move on to the next competitors, what's shaping up to be two very intense matches: Chihuahua vs. Pit Bull and Cat in the Hat vs. Cheshire Cat.